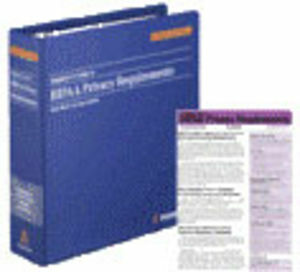 An extensive guide that helps employers comply with the complex new privacy and security requirements of the Health Insurance Portability and Accountability Act (HIPAA), the Employer's Guide to HIPAA Privacy Requirements analyzes these unprecedented federal restrictions on the use and disclosure of employees' health information and explains key terms, such as "protected health information" and "minimum necessary" disclosure. This guide also deciphers HIPAA's security, transaction and related rules, and spells out how HIPAA interacts with other laws, such as the Gramm-Leach-Bliley Act, the Americans With Disabilities Act and the Family and Medical Leave Act. Newsletters and guide updates continually provide news and analysis of emerging medical privacy issues and their impact on employer health plans. ****Please note that this item has an optional subscription and renewal process. Upon ordering, your contact information will be given to the publisher of this product and they will contact you regarding updates and renewals only. If you wish not to be contacted, please let the SHRMStore know immediately.